Nearly 25 people came out to the recruiting event for “This is Dayton” at the Cannery Art & Design Center on Tuesday the 15th. Some interesting observations– it seemed like most in the room were not originally from Dayton, and probably half of those transplants spent some time in Michigan. It’s exciting to see non-natives want to jump in and promote how great it is in Dayton– that’s a great testimonial to our wonderful city. Several said they couldn’t quite put their finger on it, but there is something very special here – especially when it comes to creativity & innovation. So we talked a lot about the initiative and the various ways to get involved and then let people sign up and mingle for a bit. The primary committee usually meets once a week, but our weekly meeting today will be “brand orientation” from the City of Dayton and the Dayton Development Coalition to see how we can tie everything together. Next week we’ll have our usual meeting, divide up the volunteers and start forming the committees. If you still want to get involved, please contact Theresa Gasper at tgasper@fullcircledayton.com and she’ll add you to the list of volunteers and keep you in the loop. If you were there, we will be getting in touch with you within two weeks to get the ball rolling. Thanks to everyone who attended and to those that expressed an interest but were unable to attend. 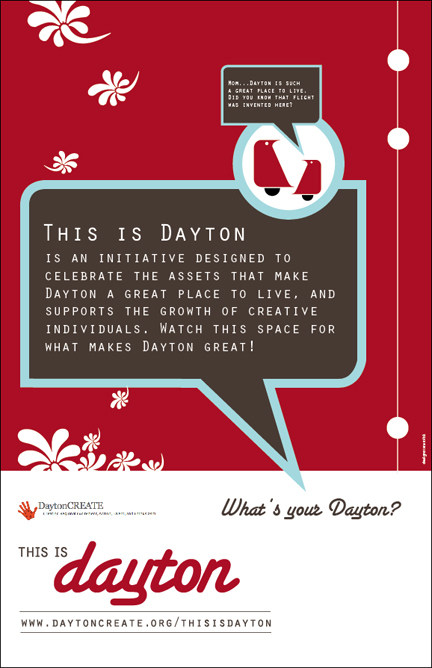 “This is Dayton” one of one of the five Creative Class Initiatives taking shape in Dayton. They will be holding a recruiting session for volunteers on Tuesday, July 15th, from 5-7pm at the Cannery Art & Design Center at 434 East Third Street. The catalysts and committee members of “This is Dayton” recognize that Dayton has an inferiority complex and are on a mission to turn that around. “This is Dayton” wants to hear from the community about how we can work together to educate each other what we do best, who are best & brightest stars, what areas do we excel at so much that other communities model themselves after us. · A poster contest (one for adults, one for K-12). Winning entries will be blown up on 5’x8′ posters and placed throughout the region in vacant storefront windows, on billboards, etc. · Radio Interviews – a weekly format interviewing Daytonians as to what they love most about their community or what they are doing to make a difference. If you have any interest in getting involved in this Initiative, please come to the recruiting event on the 15th for more information. If you are unable to attend, please contact any of the above. The Core Committee of “This is Dayton” includes Co-Chairs David Seyer and Susan Byrnes; Communications Contact Theresa Gasper, and Sally Struthers, Carol Sampson, Bridget Oaks, Donna Martin, Diane Graham and Marianne Kirk. for more information, please check back often at www.DaytonCREATE.org. 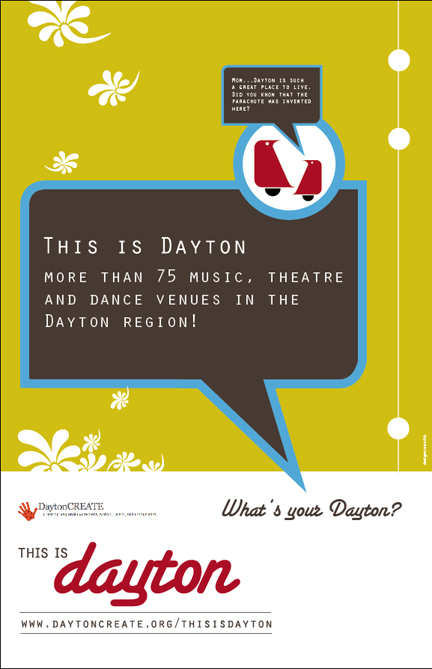 “This is Dayton” wants to let residents know how exciting and creative the Dayton region is. We are looking for people who can express “This is Dayton” with video, radio and poster form but are open to alternative forms of expression. We need volunteers to serve as ambassadors to a variety of regional community groups. We need people to help with an adult and k-12 poster contest. We also need people to collect data for use with the posters and web site. Even if you’re skills do not lie in the “creative,” we need help in all avenues of organization, execution, etc. “This is Dayton” will hold an informational meeting on July 15th at The Cannery on Third Street. Please come join us from 5-7 pm to help build the excitement. We need some feedback. Our overall initiative is “This is Dayton” which is to help Dayton over its inferiority complex. The goal is to reflect positive facts & images to the community reminding them of all our great assets. We believe it’s too easy to get caught up in what is wrong with us, but forget to stop and remember what is great about us as well. If we can shift the focus, we may be able to turn the inferiority complex into a strong sense of community pride. We’ve had some discussion about starting out with a defined style sheet and establishing “This is Dayton” but that it could possibly evolve to “this is Trotwood” or “This is WSU or UD” or “This is Beavercreek” or even “this is XYZ Church or fraternity or organization”. All of which would use the same style sheet, just reflect their own particular points of pride. On the one hand – I think we should stick with “This is Dayton” as a unifying theme for the Region. Like I’ve said in other posts, Dayton is the dot on the map or the destination on the highway signs. Many of us think a regional form of government would be better than the current way, so maybe this initiative should follow suit? On the other, I think an easy way to establish our measure of success would be to see how many other organizations jump on board with an emphasis on their particular corner of the region. I believe a rising tide lifts all boats – so if we see each individual pocket increase its self esteem or self image, does it not increase the overall self esteem of the region? Or does it just reinforce a sense of separateness rather than collaboration? Join the discussion in the Dayton Most Metro Forums! !